How Often Should You Water Potato Plants? 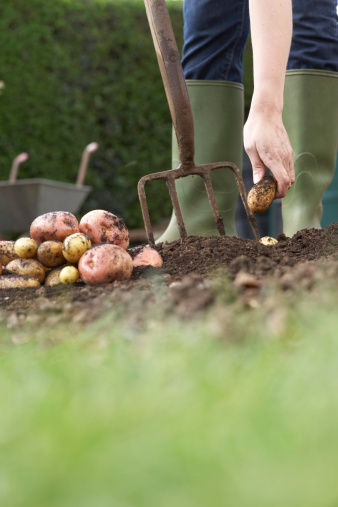 It's easy to grow a bountiful crop of potatoes in a home garden if you adhere to proper care requirements. A potato plant needs a dependable watering schedule and cool soil temperatures to produce desirable, evenly formed tubers. Too much or too little water can impair tuber formation and jeopardize plant health. Regular watering of young plants aids establishment. Although some people mistake a potato as a root, it's actually a tuber or an underground storage stem. More than 100 varieties of the potato exist, but white and red-skinned types are commonly grown in home gardens because of their appealing taste and texture. It's a cool-season crop that grows well throughout most of the U.S., but particular in Northern states that have a shorter growing season. A potato plants needs soil temperatures of about 60 and 70 degrees Fahrenheit in order for tuber formation to occur. If soil temperatures become too warm, 80 degrees Fahrenheit or warmer, tubers don't develop. A potato plant can usually tolerate light frost. Provide enough water to a potato plant so that its soil is moist, but not saturated. A plant doesn't like wet feet. The general rule is to provide it 1 to 2 inches of water per week, including rain fall. A consistent water schedule of once every four to five days is ideal for a young plant. Increase the frequency to once every two to three days when tubers form, which happens about the same time the plant flowers, to encourage uniform potatoes. Regular watering also helps keep soil temperatures cooler. Stop watering a potato plant when its leaves turn yellow and start to die back. Discontinuing irrigating a plant once it begins to wilt provides tubers longer time to cure or dry before they're picked. Drip irrigation from a garden hose works best for potatoes. Overhead irrigation can injure a young, fragile plant. Furthermore, use of a watering can tends to direct too much water to the top of the plant and too little to its roots where it's needed most. Warm, wet foliage encourages fungal growth and weakens the plant structure. Over-watering a potato plant causes irregular tuber formation, promotes rot and increases risk of disease. Conversely, under- watering a plant so that its soil dries out completely prohibits canopy and tuber formation and often leads to irregular tubers with various imperfections. The effects of poor watering practices results in a stressed plant that takes several days, even after the issue is corrected, for it to overcome.